the fash pack: new stuff! new stuff! new stuff! 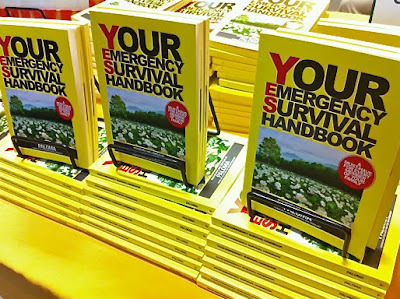 your emergency survival handbook. every home should have this book! written by renowned astrologer and feng shui expert paloma, its editor gina abuyuan assures us that the book is not filled with "esoteric woowoo," but with practical stuff every person in your household should know and be aware of in case of emergencies like fire, earthquake, floods, etc. may sound a bit pessimistic and alarmist, but disasters and calamities happen every day, and we never know when they're going to strike. and the book is in a bright yellow, so it's easy to spot. available for P295 at powerbooks. 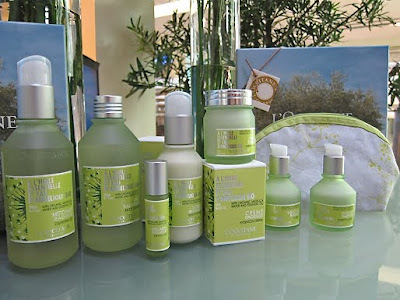 angelica (or angelique) skin-care line by l'occitane. it sounded like any other skin-care range, made from organic angelica plants grown in provence, with the usual cleanser, toner, day cream, night cream, eye roll-on (an innovation, yes, for lazy people like me who can't be bothered with a separate cream for the eyes)... but the real innovation is this product called milky lotion, which is neither milky nor a lotion. after cleanser and toner, you apply the milky lotion on your skin—and as i understood it, it's supposed to open up the little canals in your skin, so that when you apply moisturizer or serum, the skin absorbs it faster and more effectively, thus hydrating the skin better. in other words, if there's only one thing you buy from the line, dizzizit. because you can use it with your existing skin-care regimen. available at l'occitane, glorietta 4 and select rustan's. new fragrance by narciso rodriguez. these two lovely ladies have nothing to do with the fragrance, they were merely guests at the launch held at the atrium of enderun. i forgot to take a picture of the bottles, so let's just say isabelle daza and kelly misa represent them hehe.. i was a bit distracted by the h'ordeuvres being served, they were really good! (dapat lang noh enderun is a culinary school!) anyhoo, the new narciso rodriguez for her comes in two versions: a pink bottle (eau de parfum) and a black bottle (eau de toilette). same scent, different intensities. available at select department stores.